The (Unofficial) O.H. Favourite Otome Game Guy Tournament! NOTE: I just want to clarify that this is not an official Otome Hearts Tournament. I just made this for fun! I've also been inspired to create [You must be registered and logged in to see this link.]. Maybe I'll make a video game character version if these two gather enough interest. We have the means (B's Log, game specific polls, etc.) to know how Japanese gamers feel, but what about the rest of us? I'm very curious about who will come out on top to the international gamers. I'm currently organising the tournament, so while you're waiting until you can vote, take a look at the long list of hunks vying for the crown! * Japanese names are listed in the traditional way (family name, given name). 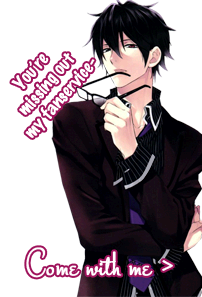 Also, once the nomination period is over, I will conduct checks on characters to make sure they're otome game only. Anybody found to be originally from any medium other than otome games will be removed. Re: The (Unofficial) O.H. Favourite Otome Game Guy Tournament! So, is this only for characters from commercial games, or can we nominate guys from indie games too? Doujin (independent) games are allowed. As long as it's a male character from an otome game, it's completely fine. I said no repeats, but if you did so inadvertently, I'll just have to ignore it. Wow, thanks for the nominations, guys! Six more days until the voting begins! At this rate, it'll have to be a series of randomised knock-out tournaments unless I want the voting period to last the rest of the year, haha. Jiwoo and Jieun from Dandelion! KawaiiMess wrote: Jiwoo and Jieun from Dandelion! Jieun... <33333 I second this nomination. That is it! Is it okay if I also nominate the boys from unreleased otome games?